Yael Lewis is twelve and the party of the year is her upcoming bat mitzvah. That is, if it isn't railroaded by her mother, her anxiety over her Torah reading and public speaking, and a couple of boys that are turning her head. But that seems the norm for an almost-thirteen-year-old girl, right? As much as I'd like to tell you more about the plot, I really can't. That's because there is no single plot line in Yael and the Party of the Year. Yael and the Party of the Year, and a second title, Tara Takes the Stage, released last year by Tamsin Lane, are part of a new series called Yes No Maybe So. 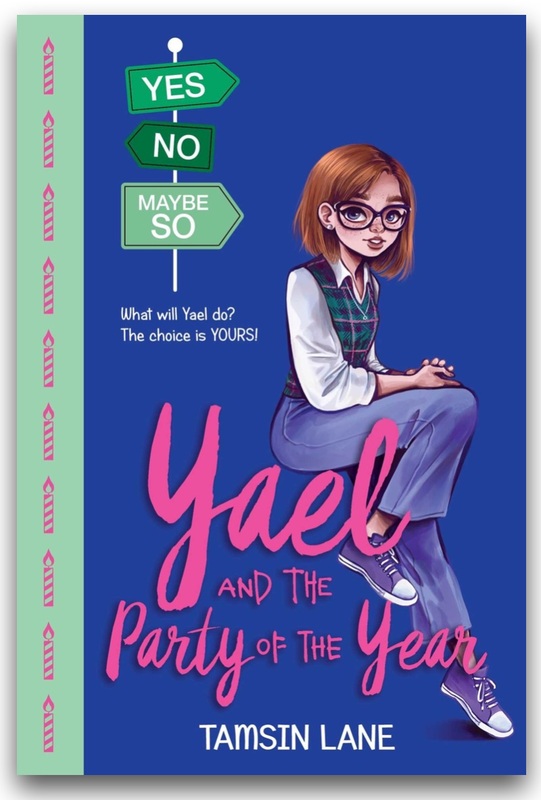 I can tell you that Yael is preparing for her bat mitzvah, that she is expected to read a portion of the Torah and that there will be a party at which she is expected to give a speech. Those elements are cemented in the story as is the venue for her party, the Maize amusement park, and her friends, Tara, Gemma and Paloma, and three boys, Eli, Cam and Gabriel. After that, it's up to the reader to make decisions for Yael. Will she go to Eli's house to rehearse her reading or to the amusement park for a tour with her parents? Does she encourage Cam to attend synagogue with her family or not or does she feign illness not to go at all? Does she focus on her girl friends or give into her crushes? Who will get that special first dance? I thought it might be impossible to review a book whose plot is determined by the choices of the reader. But a Yes No Maybe So book is less a choose-your-own-story than seeing that sometimes choices lead to only a few outcomes. Tamsin Lane, the pen name of a Canadian writer whose books I've previously reviewed on CanLit for LittleCanadians, recognizes how little things can become very big things for young people, especially when they are convinced that every decision could make or break their futures. Expecting that any decision could mean the difference between a complete and total disaster, as was Eli's bar mitzvah, and the party of the year is a heavy load for a young person upon whom great hopes are placed. Fortunately, young readers who undertake a reading of this interactive book will recognize soon enough that the outcomes may be different but they aren't always better or worse and that there's sure to be a few laughs along the way. From the epic tantrums of Yael's two-year-old sister Rivka to getting lost in a corn maze, Yael and the Party of the Year makes lightness out of seemingly critical choices. 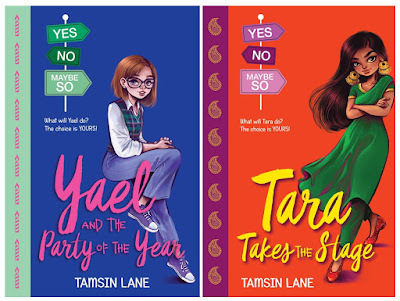 Fortunately Tamsin Lane makes sure that Yael gets a great party in the end, whether she gets kissed or not, or wears the T-shirt her mother chose or her own design, or whether her first dance is a slow one with a boy she likes or the chicken dance. I'm sure you would know! Thanks for getting me review copies of these books. What a cool concept! Must check it out.